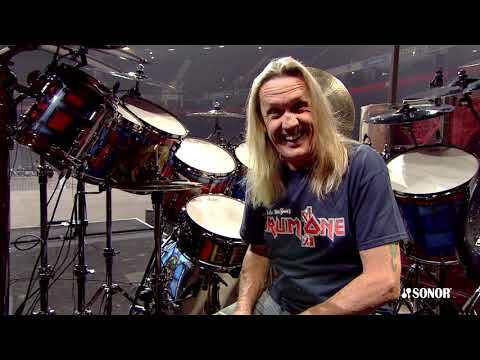 Get Up-Close And Personal With Nicko McBrain As He Runs Through His Sonor Legacy Of The Beast Drum Kit. 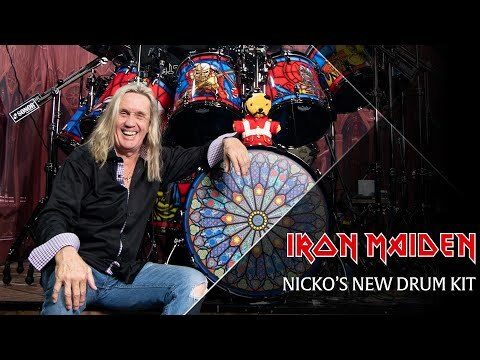 The Legendary Iron Maiden drummer has released a detailed video tour of his 2018 Legacy Of The Beast drum kit, that was used in Iron Maiden’s shows across 2018. Iron Maiden has announced a 2019 North American extension of the Legacy Of The Beast tour. Get Your Tickets Here. The video tour gets up-close to Nicko’s beautifully intricate custom-made Sonor SQ2 9-ply beechwood kit. The artwork wrapping each drum features different iterations of Iron Maiden’s mascot Eddie. Here, just let the man himself explain it, watch the videos! Sonor SQ² Custom Drum Kit – 6″ x 8″ Beech Tom. 8″ x 8″ Beech Tom. 10″ x 10″ Beech Tom. 12″ x 12″ Beech Tom. 13″ x 13″ Beech Tom. 14″ x 14″ Beech Tom. 15″ x 15″ Beech Tom. 16″ x 16″ Beech Tom. 18″ x 18″ Beech Floor Tom. 24″ x 18″ Beech Bass Drum. 14″ x 5″ Birch Snare Drum. Cymbals by Paiste – 15″ Signature Reflector Heavy Full Crash (custom). 19″ Signature Reflector Heavy Full Crash. 16″ Signature Reflector Heavy Full Crash, 20″ Signature Reflector Heavy Full Crash. 18″ Signature Reflector Heavy Full Crash. 14″ Signature Heavy Hi-Hat (Reflector Finish) (custom). 13″ Formula 602 Heavy Bell (discontinued to general public). 22″ Signature Reflector Bell Ride “Powerslave”. 17″ RUDE Crash/Ride. 20″ Signature Fast Medium. 22″ Signature Reflector Heavy Full Crash. 20″ Signature Reflector Heavy China (custom). 40″ Symphonic Gong (Custom Reflector Finish). Are you interested in making your own custom Sonor SQ2 drum kit? If the answer was yes, check out the Sonor SQ2 Drum Configurator, where you can build your own fully customized kit online! Iron Maiden: Bruce Dickinson "My Very First Time"